Although Japan doesn't get nearly as hot as parts of the United States during the summer months, there's still nothing quite as refreshing as hanging out at a water park or public pool. There are a number of great water-based attractions to visit on your summer vacation to Japan. Most of Japan's outdoor swimming pools and water parks open in late June and close in early September, and although they can get quite crowded during school summer holidays from late July through August, you should be able to find at least one place to swim or cool off with a relatively small crowd. The parks are elaborate with specialty pools for children and adults. Many are part of larger amusement complexes. As with all tourist attractions, check the associated websites for these popular pools and attractions for more information about hours of operation, special holiday closures, and pricing. Most pools have rules posted including banning tattoos, which is not unusual in bathhouses and public pools in Japan. Yomiuri Land is a popular amusement park located in the suburban area of Tokyo that offers five great swimming pools and three huge water slides. Located at 4015-1 Yanokuchi Inagi-city, Tokyo, the park is reached via the Keio Railway Line at Yomiuri Land Station or the Odakyu Railway Line at Yomiuri Land-mae Station. Other popular attractions at Yomiuri Land, Tokyo's largest amusement park, include gondola rides over cherry blossoms, the Jewellumination lighting display park, and the Goodjaba amusement area. 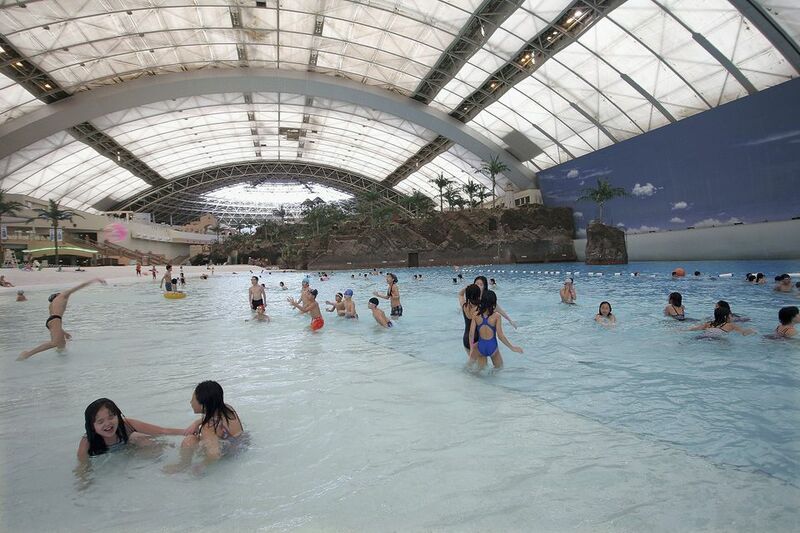 The outdoor area called "Adventure Lagoon" is known as the most fun water park in Tokyo and is open only during the summer; however, the indoor pool called Adventure Dome is open throughout the year with varying hours per season. Located in Akiruno-city, Tokyo, visitors can access Tokyo Summerland via the JR or Keio Rail Line to Hachioji Station or the JR Line to Akikawa Station. Along with the massive indoor and outdoor pools, Tokyo Summerland also features a number of large water slides, inner tubing flumes, and a variety of other water activities. It's important to keep in mind that Tokyo Summerland has some strict policies about what you can and cannot bring into the park so be sure to check the website for more information before you visit. Nagashima Spaland near Nagoya is a popular amusement park which features many thrilling rides. The Jumbo Pool itself consists of many types of water slides and pools including a natural hot spring open-air bath. It is one of the largest water parks in the world. Located at the Nagashima Resort in Nagashima-cho Urayasu Kuwana-city, Mie, visitors can reach Nagashima Spaland by bus from JR Kuwana/Nagoya to Nagashima onsen. There are special direct buses running from Nagoya that require a reservation. Visiting the website will allow you to better plan your trip, download an English guide, and even view a large-scale map of the park so you'll know exactly where you want to go before you step foot in the park. The Super Pool features a large kids pool, wave pool, and more all at the Tobu Zoo at 110 Suka Miyashiro-machi Minami-saitama-gun, Saitama with access from Tokyo via the Tobu Line at the Tobu Dobutsu Koen Station. Although the Super Pool (including its children's pool and wave pool) is only open during the summer, the zoo is open year-round and features over 120 species and over 1,200 animals (including a rare white tiger). There are also exciting rides, so even if you don't want to get wet, there's still hours of entertainment all in the same place. The Toshima-en Amusement Park is a popular park in Tokyo offering many different pools and thrilling water slides in its water park. The Toshima-en Water Park pool offers a special "night pool" for adult guests to enjoy after the sun goes down, so if you're in for an evening swim this is the ideal destination for you. Located at 3-25-1 Kouyama Nerima-ku, Tokyo, visitors can access this huge complex via the Seibu Ikebukuro Line, the Seibu Shunjuku Line, or the Toei Subway Oedo Line to Toshima-en Station. Located within the Rusutsu Resort Amusement Park, the Super Jumbo Pool includes many different types of pools including an aqua coaster, a slide pool, a fountain pool, and even a covered Olympic-sized competition pool. In order to reach this famous resort and amusement park, you'll need to catch a two-hour bus from Sapporo-city to Rusutsu-mura Abuta-gun Hokkaido. Uminonakamichi Seaside Park is a large leisure park, formerly a military base, with many flower gardens, sports facilities, a hotel, and a sunshine pool featuring a 100-meter slide. Uminonakamichi Sunshine Pools has six different types of pools to choose from including an infant and toddler area and a pool called Water Play Land that features a lot of surprises as you explore. Located in Fukuoka-city in Fukuoka, visitors can access this unique park via the JR Umino Nakamichi Station. Marine World Uminonakamichi, a large modern aquarium, is located just across the road and railway line from the Wonder World Gate of Uminonakamichi Seaside Park. Spa Resort Hawaiians is a large theme park consisting of many fun facilities, hotels, and other attractions. There is a hot spring dome where adults can bathe without clothing (men and women have separate pools) and take advantage of spa services. The main pool area features water slides and a large swimming pool. Children can play in a Hawaiian themed area with rivers and coves to explore. There is also an aquarium cave where you can see fish in the aquarium as you swim along. Located at 50 Warabidaira Joubanfujiwaramachi Iwaki-city, Fukushima, this famous resort also features a number of shops and services. What Are the Best Theme Parks in Tokyo? How Do I Get to the Wild Monkey Parks of Japan?